Enjoy one level living and an open floor plan warmed by a modern day gas-burning fireplace. A wall of windows showcases the natural flora and river views – take in the Blue Ridge beauty without leaving the sofa! The living space extends to the massive covered porch, our favorite spot for an afternoon BBQ. The kitchen lets you cook like you’re at home with a full selection of pots, pans, dishes, glassware and more. Find fresh, locally grown dinner ingredients at the West Jefferson Farmers Market (10 minutes away). Enjoy your family feast indoors or outdoors both areas each offer seating for 6 people. The focal points of the vaulted great room are the wall to wall windows and gas burning fireplace. Sit back and relax on the comfy sleeper sofa and enjoy the majestic settings, flat screen TV or the dancing flames of the fireplace. The spacious master bedroom offers a queen size bed, lots of windows for the natural light and cozy reading nook. The private full bath offers a tub / shower combo and double vanities. The second bedroom offers queen size bed and shared bathroom with walk in shower. Rendezvous at the River is located in the heart of the High Country offering some of the most popular area attractions and outdoor recreation. In the winter enjoy skiing, snowboarding, snow tubing or ice skating at one of the many area resorts. In spring / summer enjoy New River activities such as tubing, kayaking, canoeing and fishing. Some of the best trout / small bass fishing is in this area. Warmer months are also a perfect time for horseback riding, hiking along the Blue Ridge Parkway or bicycling along one of the scenic routs located through the area. 4WD or AWD required during winter months. My daughter/husband and I spent a weekend at Rendezvous in the River in February. The home is a beautiful building, sitting on a trees lot above the New River. The furnishings were nice, the kitchen was well stocked with everything you need to cook, and the beds were comfortable. 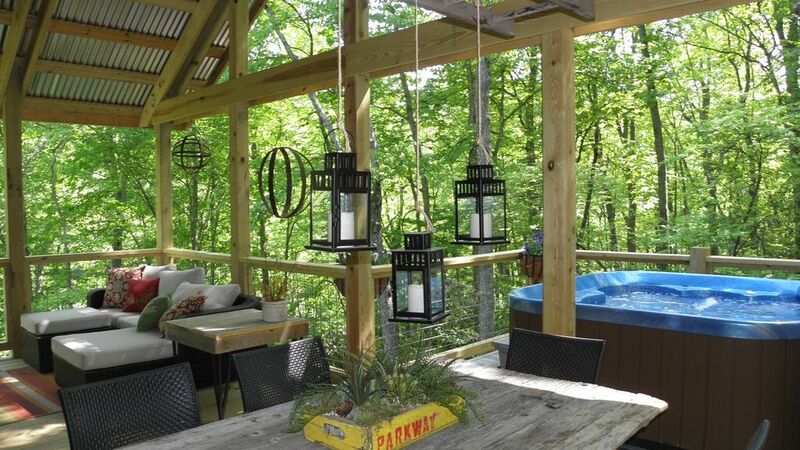 There is a gorgeous covered porch with a hot tub. The town of West Jefferson is very close and has very good restaurants. When we ate/drank in town, we were not disappointed. I look forward to another stay at Rendezvous on the River and would recommend it. Great place, beautiful views, responsive owners. Everything you need for a quiet get away! We will definitely be coming back!! Our experience was excellent. Rendezvous was one of the best NC mountain homes we have ever stayed in. The outdoor living space was the best! Also very convenient to the awesome town of West Jefferson. Had a great stay over an extended weekend trip. Very peaceful and quiet. Close to West Jefferson, NC, which is a lovely little town nestled in the mountains. The owners were very swift and courteous when we needed some assistance. Had a ton of fun! This rental was very well appointed and immaculate. If a pet ever stayed here you would never know it. Owners are a stones throw away and very welcoming and engaging without being intrusive. Great sleeping beds. You can feel like you are up in a tree house. Great spot for fishing. We will be back.